This is a general report on the conclusions reached by research and survey of the remains of the Ley Energy system on the Cambrain coast mid Wales on both sides of the Mawddach estuary next to Barmouth and Fairbourne. The remains of the Ley system comprised of: standing stones, stone circles, mounds and burial chambers and other markers. On one side of the estuary (Fairbourne) all the standing stones where charged with Ley Energy and were conducting energy lines. On the other side whilst there was an abundance of standing stones there was no energy present. On investigation I found that the two stone circles that were originally supplying the stones with Ley energy had sunk into the marshy ground. 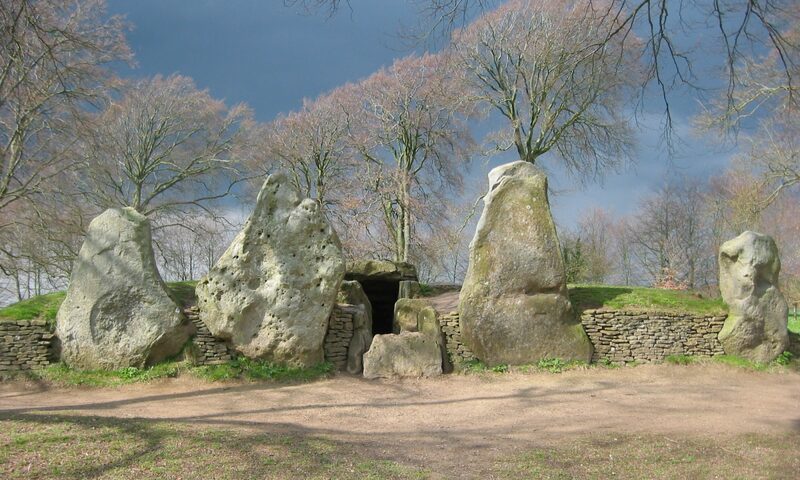 The stone circles were located and found to be still live in the ground but not able to transmit on their power to the lines of standing stones in their vicinity. The survey was carried out using various dowsing techniques. Stones act as relay stations by storing a charge from a line to give power to relay the line (energy) to the next stone (station). A stone will loose its charge if an energy line ceases to pass through it or if its charge has not been “fixed”. See “Ley Lines Their Nature And Properties” by J Havlock Fidler 1983. The power of the stones determines the power of the line. The stones collect their energy from one point then transmit it down the line from stone to stone, in most cases joining the Ley grid on roughly the same principle and possible size as the present British electric national grid system. Standing stones do not irrigate or give power to the land. It requires two charged stones in line to transmit a line of energy. One charged stone isolated will only radiate energy around itself in a circular band. A slab shaped standing stone cannot transmit a line with out assistance from other stones. Charged stones must be in a precise line if they are to relay energy lines to each other. Where two charged stones are in line (within a certain distance) there will be a line of power between them. If a third stone is placed directly in line within a certain distance depending on the power of the stones (and in turn the line) a line will flow to this third stone and charge it. However, if there is no point of attachment from stone one or two no line will radiate from the two stones (1&2). Standing stones do not need to be partly buried to be effective unless they are taping and an underground energy source. Stone Cairns (mounds of small stones) can be used to replace standing stones and are just as effective. Standing stones may have bands of energy present, which are well documented by various authors. Quartz acts as a neutralizer. For example, if you place sufficient quartz on a charged standing stone, the stone will be removed from the Ley Energy grid system. When the quartz is removed from the stone it rejoins the system. An underground energy source is tapped or connected by one stone above (part buried), which in turn charges another stone in its field or aura forming a line of charge between them. This could be the start of energy Ley Line. A spring can also be connected by a stone already on an existing energy Ley line thus boosting the power of the Line and in turn the energy grid. A stone connecting an underground energy source or spring must be partly buried, normally one third underground. Stone circles were placed over energy springs. In most cases only one stone is directly over the spring. Stone circles do not amplify the power but the lines of power flow to all the stones forming a circuit around the circle allowing the energy source to connect with other energy sources through inter connecting energy Ley Lines from other stone circles. Energy sources or springs are found at crossing energy streams, which are positive and negative in polarity. These energy streams flow underground and in many cases are carried by water. The energy is brought to the surface by partly burying a stone above. The stone will then become an energy conductor. For more details on energy streams see “The Sun And The Serpent” by Hamish Miller And Paul Broadhurst. 1989. An Energy Ley is a line of power travelling in a straight line between two charged points, normally standing stones or Cairns. Britain has the remains of a grid system of Ley Energy Lines all interconnecting on a similar principal as the modern British national grid system. The system was built thousands of years ago. A Ley line is made up of two energies, it has a positive and a negative charge. The positive charge is represented by the number 666 and has the Sun as a symbol. The negative charge is represented by the number 1080 and has the moon as a symbol see ‘The New View Over Atlantis’ by John Michell 1983. The two energies fuse together in the same way as negative and positive electricity, it has been given a number of different names in different cultures. In ancient tines the two numbers representing the negative and positive energies (1080 and 666) were added to give the number of fusion 1746. Today the fused energy is known as Orgone energy, Prana Energy, Chi or Life force/vital Energy. For the remainder of this report it will be called Ley Energy. Ley Energy is the vital energy, which all living organisms need to live on Earth from the lowest plant life to humans. Ley Energy has a number of uses these include healing, life giving, health and well being and has a occult or magical significance. Stonewalls interfere with Ley Energy Lines but do not stop them. Fences with a 35mm or less Gap can stop them (see Ley Lines their Nature and Properties by J.H. Fidler). Mirrors can reflect and stop Energy Ley Lines. Ley Energy is related to electromagnetism in some way and the Earths south and north poles. Chamber mounds are often built on Ley Lines to store Ley Energy; these chambers are first lined with inorganic substance then alternate layers of inorganic and organic materials. These mounds act much like a modern day battery, but store Ley Energy rather than electricity. “Hill Forts” were not Hill Forts; they were built as part of the Ley System. Ley Energy was trapped in the enclosure on the hill and probably had the same use as chamber mounds. Energy Ley Lines travel only above ground as described in this report. Energy Ley Lines cannot connect into the energy grid when crossing over each other without a stone. The following experiments are to support The Ley Line System Report dated 27th December 1985. These Experiments will use tested dowsing methods by experienced dowsers. Build a Cairn (mound of stones) or stone if possible on Known Energy Ley. Measure the strength of the line before and after building the cairn/stone. Measure the charge in the cairn/stone after erection then again after 48 hours. During erection handle the stone/s lightly to avoid fixing a personal charge. Test quartz by placing it on a live standing stone; take measurements of the charge on the line and stone before and after placing the quartz. Find an underground energy spring/source, which should be a negative and positive energy flow crossing and fusing in to Ley Energy. Erect a stone on it making sure the stone is one-third under ground. Check for a charge on the stone, if a charge is obtained continue with this experiment. Erect a second stone in the first stone energy field or aura thus charging the second stone. There should now be a line of force between the two stones. Erect a third stone in a precise line with the two stones at a distance of about 20 feet depending on the degree of power being used and the size of the stones. A line of power should flow from stones one and two to charge the third stone forming the start of an Energy Ley Line. Test charges after 48 hours then weekly. Take care to isolate power from existing Energy Ley Lines and any other points which might act as conductors. Sheet metal or wire with a gap less than 35mm will stop a line. To neutralize a stone place a small block of quartz on top. This information is intended to supplement the Energy Ley Line Report December 1985 and is of use to experienced dowsers only. The Ley Energy is measured using the same terms and laws used when measuring electricity. Volts are pressure. Amps are the quantity of Ley Energy Units passing a given point. One unit of Ley Energy is one Amp. To measure volts (pressure) and amps (quantity) we use a pendulum, the length of the pendulum is important not the weight. The length of the pendulum is 600mm/60cm the pendulum is rotated over a ruler with a mm scale up to 800mm, the reading off the ruler is then doubled. So 10mm is equal to 20volts not 10volts, 100mm is 200volts and so on. Measurements of up to 1600 volts can be taken this way. For voltages over 1600 use the inch scale, 1-inch equals 1000v, half an inch is equal to 500v. The inch can be divided into units of 125 volts if required. The length of the string is 300mm/30cm. The pendulum is gyrated over a given point for ten seconds. The total number of gyrations in 10 seconds gives the quantity/number of amps. Above 60 amps up to 600 amps use the same length of string but 1 gyration is now equal to 10amps. To find the total power find Watts. Volts X Amps = Watts. 1000Watts = 1Kilo Watt. Because the wattage is normally very high when dealing with Ley Energy wattage is normally expressed in kilo watts (kw). A 10% error must be allowed for on all measurements . It is possible to take measurements on site, or from photographs. I prefer the latter method. The dowser uses the photograph to tune in to the stone concerned. When measuring the line between the stone the on site method is recommended. Average human power capacity 520volts 21 amps 10.92 Kilo Watts.